Se trata de una herramienta muy útil para arreglarnos las uñas y limarnos las durezas. Con el utensilio en sí, nos vienen varios cabezales, cada uno para una función. Tenemos para las cutículas, para pulir las uñas, para poner las lijas cilíndricas que tiene y pulir mejor las uñas, para las esquinas, etc, ningún rincón de la uña se va a quedar sin su repaso. Aparte nos viene también el adaptador de corriente para que funcione, que en este caso es de clavija china y nos viene con un adaptador a la europea incluido. En el mango, tenemos una rueda para regular la intensidad del funcionamiento, desde muy despacio hasta una buena velocidad considerable. Es muy ligero porque realmente es todo de plástico, menos los cabezales y no pesa absolutamente nada, se maneja con mucha facilidad. 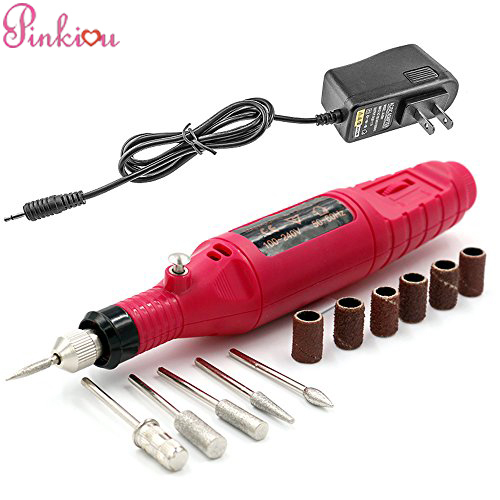 It is a very useful tool to fix our nails and get rid of hardness. With the utensil itself, we have several heads, each for a function. We have for the cuticles, to polish the nails, to put the cylindrical sandpaper that has and better polish the nails, for the corners, etc., no corner of the nail is going to be left without its review. Apart we also comes the power adapter to work, which in this case is Chinese plug and comes with a European adapter included. In the handle, we have a wheel to regulate the intensity of the operation, from very slow to a good considerable speed. It is very light because it is really all plastic, less the heads and weighs absolutely nothing, is handled very easily. thanks for good review, welcome to our www.pinkiou.com. It will not disappointed you. I am really grateful to the holder of this site who has shared this wonderful paragraph at at this place. We are a gaggle of volunteers and starting a brand new scheme in our community. Your website offered us with valuable information to work on. You’ve done an impressive job and our entire neighborhood will be grateful to you. Hello there, You have done a fantastic job. I’ll definitely digg it and for my part recommend to my friends. I’m confident they’ll be benefited from this web site.